Jennifer Stoever’s students used items at TechWorks! to add to the Binghamton Historical Soundwalk Project, an aural history. Guglielmo Marconi, developer of long-distance radio transmission, used the Marconi Tower on Lewis Street in Binghamton to prove that wireless messages could be successfully exchanged between stations in Binghamton, Scranton, Pa., and a train traveling 60 mph between the cities. The messages, called aerograms, were sent in Morse code on the telegraph. Image Credit: Jonathan Cohen. Jennifer Stoever’s students used items at TechWorks! to add to the Binghamton Historical Soundwalk Project, an aural history. Guglielmo Marconi, developer of long-distance radio transmission, used the Marconi Tower on Lewis Street in Binghamton to prove that wireless messages could be successfully exchanged between stations in Binghamton, Scranton, Pa., and a train traveling 60 mph between the cities. 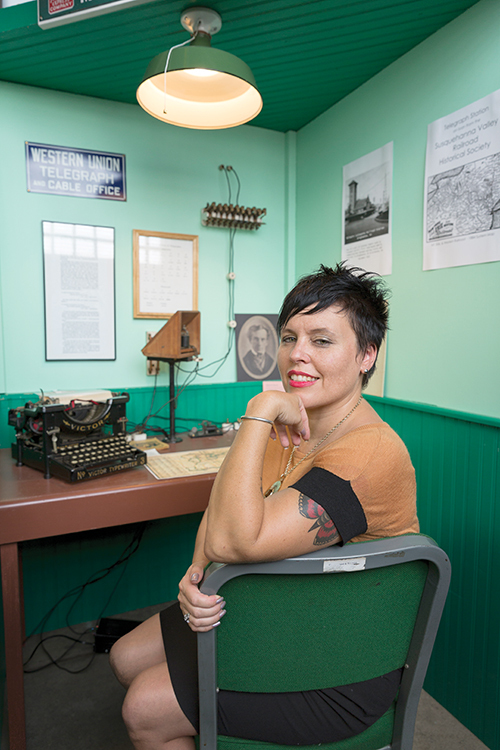 The messages, called aerograms, were sent in Morse code on the telegraph. Photography: Jonathan Cohen. When Tyisha Miller, a 19-year-old African-American woman, was shot dead by police in southern California in 1998, the incident gained national attention over allegations that the killing was racially motivated. But for Jennifer Stoever, the incident was personal. Miller was her former student, and her death further cemented Stoever’s drive to take on social justice issues through research. Of hearing? You read that right. Stoever takes an unconventional approach to social justice research: Her work revolves around the social, cultural and political aspects of sound and listening. Sound is not a subject commonly brought up when discussing racism and social strife, but Stoever thinks it’s crucial. According to her, we don’t take in sound without interpreting it; listening is a subjective experience. Stoever addresses these issues in her new book, The Sonic Color Line: Race and the Cultural Politics of Listening (NYU Press, 2016). 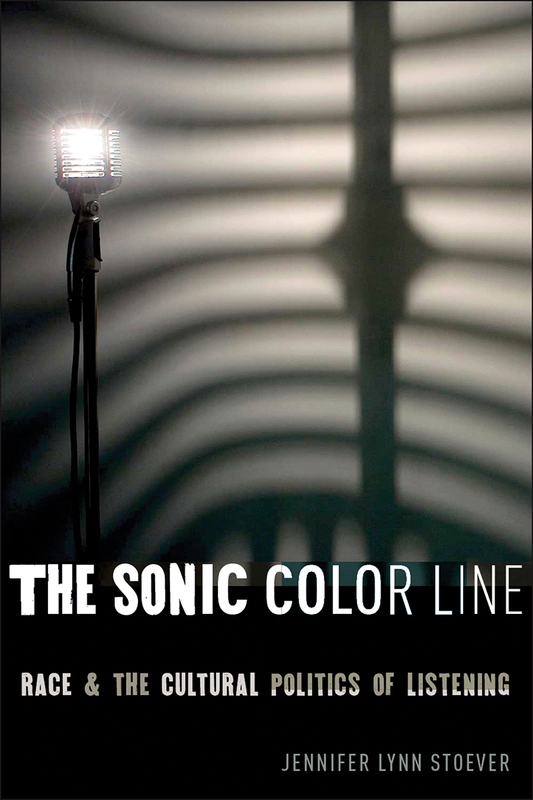 The Sonic Color Line is a history of how sound and listening have become racialized in the United States and, at the same time, how we as Americans understand ourselves in terms of race in regard to sound and listening. The book starts during the antebellum period, 10 to 15 years before the Civil War, and shows how sound and listening have allowed racism to proliferate over time. It stops at 1945, when the beginning of the theory of colorblindness begins to take shape. “This gives us a way to start the conversation and start recognizing how these patterns of listening influenced by racial stereotypes impact our daily lives, so we can figure out how to dismantle them,” Stoever says. Stoever is a longtime music lover — she got a turntable and started a record collection when she was just 5 years old. Stoever explores this phenomenon in her new book, The Sonic Color Line: Race and the Cultural Politics of Listening (NYU Press, 2016). “Why is there this idea that black voices are ‘raw’? Why do we have these stereotypes that shape how we hear and interpret sound, and where do these come from? These are the types of questions that prompted me to start my book,” Stoever says. This trend continues today. Stoever notes that today’s critics use some of these same words to describe the voice of modern soul singer Sharon Jones, despite Jones singing in a completely different style and genre. According to Daniel Santos ’16, a former student of Stoever’s, the ways that we listen are related to and enforced by relations of power; sound complements and even stands in for visual markers of race. “Thus, someone can ‘sound black,’ and certain sounds can stand in for certain ethnic groups, whereas ‘whiteness’ is inaudible, not because it’s ‘normal’ but because there’s this perception that white, American English represents the American identity,” he says. Growing up in California in the 1980s, Stoever lived through what she saw as “intense inequity.” During her teen years, she spent a lot of time in the local ska-punk scene, where fans and bands often addressed racial and social justice. Stoever graduated from high school in 1992, in the wake of the Los Angeles Rodney King riots. “Music was an escape. All of this negativity and tragedy in the world around me could become something that was utopic, kind of the place where people come together to imagine other forms of existence,” she says. When Stoever got out of college, she took a job teaching high school English, and Miller was in her very first class. It was during this time that she started questioning why some students were tracked as advanced, while others were not, why some were labeled as problems and others as compliant. To approach this and other issues from a novel perspective, she started her research into sound studies. Her blog, Sounding Out!, has become a go-to resource on the topic. “I wanted to, in some way, contribute my knowledge to what I think is the most important collaborative project of our time, which is social justice and human rights,” Stoever says. When Stoever launched a course on sound studies at the University, she originally titled it Intro to Sound Studies. When hardly anyone registered, she changed it to How We Listen, and the class filled immediately. “Sound studies is not really the study of sound; it’s the study of how we listen, not just biologically, but without discounting the physical nature of it. But where does the physical meet the cultural, historical and psychological?” Stoever asks. Students in the class have helped Stoever further develop the Binghamton Historical Soundwalk Project, a civic engagement project that uses sound studies to help make disparate groups in Binghamton aware of the sonic space they share and how their own listening practices affect one another. The Binghamton Historical Soundwalk utilizes the concept of a soundwalk (any walk or excursion where the sounds around you are the focus) in combination with oral histories and other historical data to encourage participants’ engagement with their environment and put their aural experiences in a historical context. Daniel Santos ’16 and fellow students pursued this particular project because they noticed a misunderstanding among yearlong residents and students, many of whom live in Binghamton temporarily. Stoever loves the sonic opportunities that downtown Binghamton provides. “It is literally a sound laboratory for me to test my ideas. We don’t often think about humanities research in that way,” she says. This academic year, she will call on students to collect sounds from local residents in order to better represent their perspectives. With her blog, her new book and the ongoing Soundwalk project, which she documents on her Sounding Out! blog, Stoever hopes to not only educate her students and the people of Binghamton but also to contribute to the national discussion around race and social strife in America.